since then we emphasize our power for developing precision rubber parts. By rapid progress of electric equipments, the machines have developed to multiple and high performance, and its structure is complicated and compact. Rubber products are required to cooperate with other machine parts, absorb shock, open-close performance and more of various demands. We listen to our customers' needs and we enable to downsize and complicated moulding by continuous material study, research and development. KEF, as an advanced rubber products manufacturer, we seek for capability of rubber and develop our technical area to fulfill our customers' needs. The earth represents environmental preservation and our world-wide progress. The blue color around the earth symbolizes our employees, the green color stands for our customers and the red color is drawn as our products. KEF (Hong Kong) Co., Ltd.
Kyowa Kako was established as a limited-liability company dealing with wrist watch packing supplier in Shibayama, Funabashi Chiba. A sales agent for the Western Europe was founded in Switzerland. Then the overseas market expanded to areas in Southeast Asia and the U.S. Moved the whole operation from Funabashi to Sakura in Chiba. Changed the corporate body from the limited-liability company to a joint-stock company. 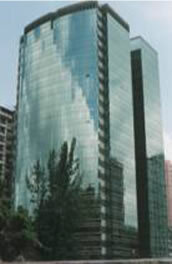 Completed construction of the new office building for the company. Started to develop materials for hard disk drives for computers and began sales for packing used in hard disk drives. Established Kyowa Kako (Hong Kong) Co., Ltd.
Certified ISO9002 (in head quarter and factory). Started Kyowa Precision Rubber and Plastics Factory in China. Increased its capital from JPY 80,000,000 to JPY 98,000,000. Certified ISO9001 (in head quarter and factory). Founded "KEF Corporation of America". Changed its company name from Kyowa Kako Co., Ltd. to KEF Corporation. Also, Hong Kong office changed her name to KEF (Hong) Co., Ltd. accordingly. Certified ISO9002 in KEF (Hong Kong) Co., Ltd. And the factory in China. Increased production facilities in Kyowa Precision Rubber and Plastics Factory in China. Started the sales of packing for digital cameras. Started to develop materials for inkjet printers and began with the sales of packing for those application. Started its operation in the second factory in Kyowa Precision Rubber and Plastics Factory. Certified ISO9001 in KEF (Hong Kong) Co., Ltd. And the factory in China. Awarded by The Nikkan Kogyo Shimbun Ltd. "Prize for Encouragement" by dust-proof gaskets. Built more facilities in the factory in China. Certified ISO14001 in head quarter and factory. Certified ISO14001 in KEF (Hong Kong) Co., Ltd. And the factory in China. Established KEF Research and Development Centre in Venture Plaza, Funabashi. Elected one of "Introducing 300 of Japan's Dynamic Monozukuri (manufacturing SMEs" by the Ministry of Economy, Trade and Industry. Collaborated to improve extremely high pressure-proof packing for space use, and assembled in a wrist watch of astronaut. Received testimonial letter from Seiko Epson for the success.